South Canterbury, in the central South Island, stretches from the Southern Alps to the east coast. Timaru is its only city, and towns include Waimate, Temuka and Twizel. The 2013 population was 55,623. Snowy mountains, glaciers, braided rivers, blue lakes and rolling hills: the landscape is spectacular. In two hours you can drive from the beach to ski fields in the alps. Tourists go jet-boating, climbing and fishing. Aoraki/Mt Cook National Park has New Zealand’s largest glaciers, which have carved out valleys and created Lakes Tekapo, Pūkaki and Ōhau. The main rivers are Waitaki and Rangitātā, flowing from the ice fields. 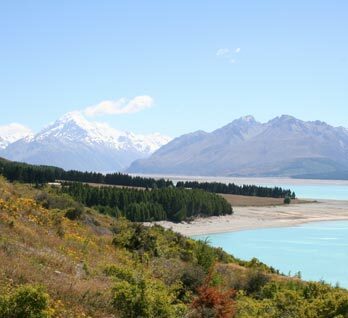 Mountaineers enjoy the challenge of the country’s highest peaks – Aoraki/Mt Cook is 3,724 metres high. Much of the region is grassland for sheep, with little native forest. Some tough plants, including buttercups, grow in the mountains. People often see the kea, a cheeky alpine parrot, around Aoraki/Mt Cook. The flat Mackenzie Country is famous for its sheep runs, which cover thousands of hectares. Hardworking sheep dogs have always been important, helping to round up sheep in the hills. Wheat farming boomed in the early 1900s, and flour mills were built in Timaru. The city still has a huge brick mill producing flour and stockfeed. Berry fruit grows well around Waimate, which has an annual strawberry festival. In 1951 a dam and power station began producing electricity from Lake Tekapo. Others followed and the region now has more than 50% of the country’s hydroelectric storage. Timaru began to grow when brothers William and George Rhodes started a sheep run near the coast in 1851. Other British settlers soon arrived, settling in the town and farmland around it. Many ships were wrecked on the coast, so a harbour was built for shelter. This became a busy port. The new harbour created a sandy beach at Caroline Bay, where holidaymakers go every summer. There is a fairground and an annual carnival.